These 2 files are placed inside the Library folder. Add to your Xcode project. Select to ‘copy the files’ into your project. GameAnalytics.h Required header file containing methods for GameAnalytics. libGameAnalytics.a Required static library for GameAnalytics when not installing via Cocoapods. The framework is called GameAnalytics.framework. Add this to your project. When using a Framework it is needed to use the following when importing GameAnalytics. Find our registered pod here. If you have not used pods before, then it is recommended to go to cocoapods.org and read more about it. When installing through CocoaPods you should not have to add dependency Frameworks/libraries manually. To use the SDK in Xcode it is needed to add both the SDK library and it’s dependencies. 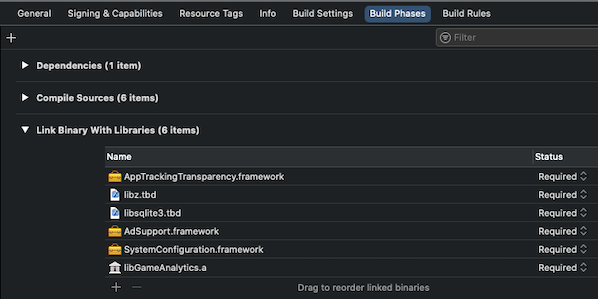 In the “Build Phases” section add the following to “Link Binary With Libraries” for Xcode7 (using .tbd libraries). In the Build Settings for the Xcode Swift project locate the section called “Swift Compiler – General” and the field “Objective-C Bridging Header“. Add a link to the GameAnalytics-Bridging-Header.h file. It should now work in Swift throughout the project. Build is used to specify the current version of your game. Note that if you introduce this into a game that is already deployed (using the automatic id) it will start counting existing users as new users and your metrics will be affected. Use this from the start of the app lifetime. For certain types it is required to define a whitelist containing possible unique values during the configuration phase. When the SDK is being used (after initialization) only the specified values will be allowed. 20 values are allowed for each list. Processing many unique dimension values can be taxing for our servers. A few games with poor implementation can seriously increase cost and affect stability. Games will be blocked if they submit too many unique dimension values. We have this configuration requirement to guide users into planning what dimension values can be used. Once initialize is called it will start the first session and automatically handle session changes based on activity events. Read more about sessions here including manual session handling. It is important at this stage that you make sure the initialisation is done correctly. You can verify this by looking after logs tagged with GameAnalytics that confirm events are being sent. Read more about printing info and verbose logs here. You can adapt the SDK to track iMessage extension apps. Due to the nature of extension apps the initializing phase needs to be nested under an initialize check in the viewDidLoad method in the MessagesViewController.m (or MessagesViewController.swift for Swift) script. Now open the MessagesViewController.m script and initialize the SDK. // Do any additional GameAnalytics setup here (custom dimensions, enable/disable logging etc). Remember to import the GameAnalytics.h header. The SDK tracks the activity within your extension. If your extension contains multiple games then we suggest to track the custom activity of each game using design events. If your extension has multiple games we suggest recording the session time locally and sending it as a value attached to a design event. GameAnalytics supports 5 different types of events: Business, Resource, Progression, Error and Design. If you are new to GameAnalytics and our Events, please read our event guide here. You will get the most benefit of GameAnalytics when understanding what and how to track. Configuration within the GameAnalytics tool is needed before receipt validation will be active. Please note that sandbox receipts will be flagged as valid. Read information about validation and requirements for different platforms here. Using an alternative method it is possible to let the SDK retrieve the receipt automatically when called directly after a successful in-app purchase. In Objective-C you implement IAP using the SKProduct classes. When initializing you would call the initWithProductIdentifiers method using the SKProductsRequest and get a list of products (valid and invalid). Also when completing the actual purchase you should have the SKProduct object. It is possible to use code frameworks that handle IAP flow (like soom.la) and thereby get this information from that code. Make sure the price is in cents and that the currency strings are returned as required. Subtract gem currency to buy an item. Subtract gem currency to source (buy) some amount of another virtual currency (BeamBooster). Be careful to not call the resource event too often! In a game where the user collect coins fairly fast you should not call a Source event on each pickup. Instead you should count the coins and send a single Source event when the user either complete or fail the level. Read more information regarding the resource event here. Make sure you locally test the instrumented resource events and they are being sent without any difficulties by verifying the info and verbose logs at runtime. Progression events are used to track attempts at completing some part of a game (level, area). A defined area follow a 3 tier hierarchy structure (could be world:stage:level) to indicate what part of the game the player is trying to complete. Add a progression start event using only Progression1. Read more information regarding the progression event here. Read more information regarding the error even here. Every game is special. Therefore some needed events might not be covered by our other event types. The design event is available for you to add your own eventid hierarchy. A bad implementation example: [level_name]:[weapon_used]:[damage_done]. level_name could be 100 values, weapon_used could be 300 values and damage_done could be 1-5000 perhaps. This will generate an event hierarchy with: 100 * 300 * 5000 = 1.5M possible nodes. This is far too many. Also the damage should be put as a value and not in the event string. The processing will perhaps be blocked for a game doing this and cause other problems when browsing our tool. For more information on the design event go here. The SDK is designed to be as silent as possible and use very few resources. You will therefore not get much information by default in the Xcode console. We have 2 different debug log types that can be enabled / disabled independently. Short messages will be output when enabled explaining when some action is being performed by the SDK. Sometimes cropping text / values to make it more readable. Enable info log when implementing the SDK – remember to turn it off in production! Console output when each event is added (all fields) in JSON string format. This is the data being submitted to the GA servers for each event. Enable verbose log when troubleshooting events. This can result in a lot of text. When troubleshooting/debugging events it is therefore recommended to enable/disable when performing the action that need inspection. Troubleshooting example. Enable the Info Log to verify that events are being sent from your game project without any issues being reported. Events submitted should register after a minor delay in our realtime dashboard in the GameAnalytics dashboard. By default the SDK will handle session start/end automatically, but it is also possible to manually control this yourself. Be aware that the initialization will always automatically start the first session even with manual session handling. On iOS a new session will start once the SDK is initialized or when the game is going to foreground. A session will end once the game is going to background. You can enable/disable manual session handling if you wish to control when sessions end/start. With manual session handling it is recommended to also call endSession when the game event going to background is fired. This will ensure a correct session close when users click the home or on/off button. If a current session is active then it will end the current session and start a new one. This is what happens when the session is starting or ending. If you are deploying testflight builds then please note that user id’s are handled a bit differently. The testflight environment is lacking any useful identifiers (they are random each app launch). The SDK will create a random user_id internally and use it for each app launch. If the game is removed and installed again, then a new user_id will be created though and it will register as a new user. Once it is deployed to the app store (or run locally on an actual device) it will track users (returning etc.) correctly. The queue will execute each task sequentially. If the SDK add several tasks to the queue then each will have to wait until it’s turn. A task could be adding an event or submitting queued events. Consider this example with 3 calls.